N1QL Pushdowns optimize the performance of N1QL queries by supporting GROUP BY and Aggregate expressions. This features improves performance of N1QL queries with aggregations and GROUP BY execution. Pagination optimization, by pushing the OFFSET and LIMIT parameters to the index scan. 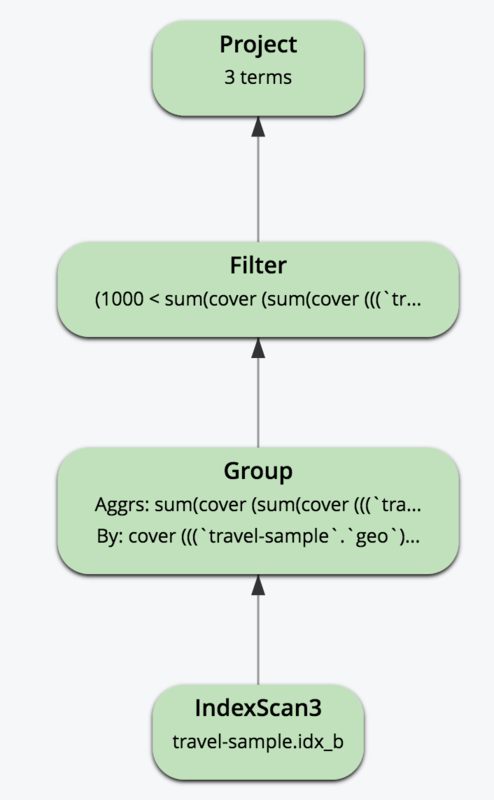 Grouping and aggregation pushdown to the indexer (introduced in Couchbase 5.5). 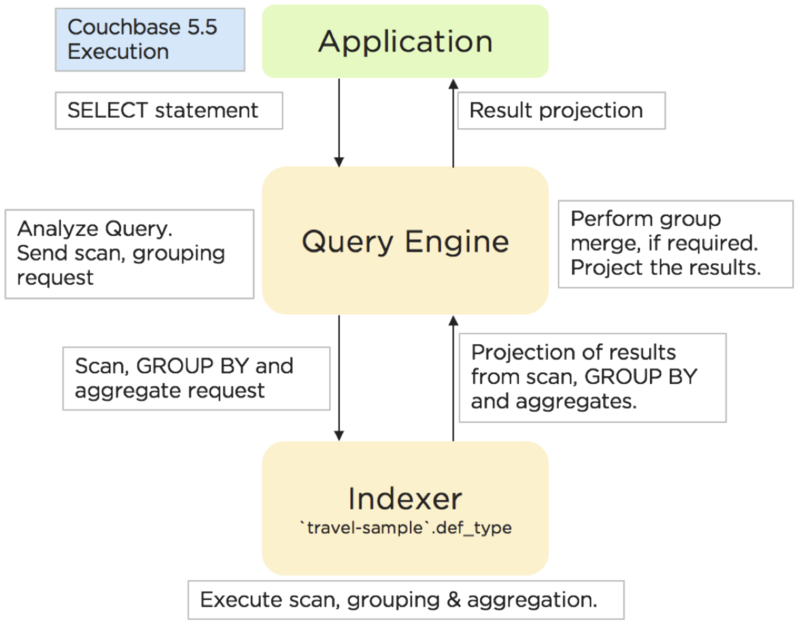 Prior to Couchbase 5.5, even when a query with aggregate and/or GROUP BY is covered by an index, the query fetched all relevant data from the indexer and group the data within the query engine. With this enhancement, the query intelligently requests the indexer to perform grouping and aggregation in addition to range scan. The Indexer has been enhanced to perform grouping, COUNT(), SUM(), MIN(), MAX(), AVG(), and related operations. This requires no changes to the user query, but a good index design to cover the query and order the keys is required. Not every query will benefit from this optimization, and not every index can accelerate every grouping and aggregation. Understanding the right patterns will help you to design your indexes and queries. Aggregate Pushdown to the global secondary index is supported on both storage engines: Standard GSI and Memory Optimized GSI (MOI). 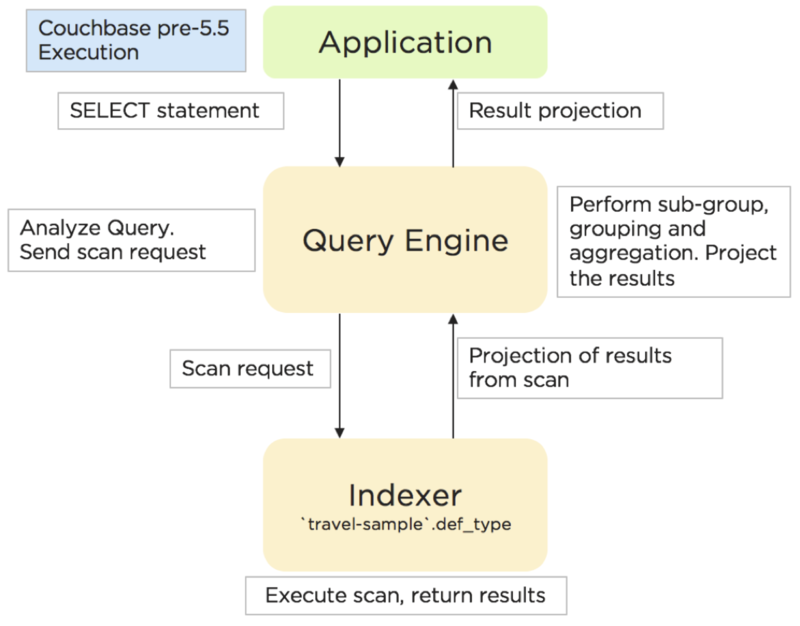 Before Couchbase version 5.5, this query engine fetched relevant data from the indexer and group the data within the query engine and then aggregate. This simple query takes about 250 ms.
Now, in Couchbase version 5.5, this query use the same def_type index, but executes in under 70 ms. In the explain below, you can see fewer steps and the lack of the grouping step after the index scan because the index scan step does the grouping and aggregation as well. The text explain plan shows the accelerated aggregation details. For details, see the Query Plan Fields section. For your reference, this is how the same query executed before 5.5. CREATE INDEX idx_a ON `travel-sample` (geo.alt, geo.lat, geo.lon, id) WHERE type = "airport"
Let’s consider sample queries that can benefit from this optimization and the queries that cannot. This query has no predicate on the leading key geo.alt. The index idx_a cannot be used. This query has no predicate at all. The aggregate depends on LET variable. In the following query, the GROUP BY keys (geo.alt, geo.lat) are the leading keys of the index, so the index is naturally ordered and grouped by the order of the index key definition. Therefore, the query below is suitable for indexer to handle grouping and aggregation. The following is a bottom-up rendering of the execution plan for easier viewing. In this case, the indexer sends partial group aggregation, which the query merges to create the final group and aggregation. In this scenario (when the grouping is on non-leading keys), any query with aggregation and DISTINCT modifier cannot be accelerated by the indexer, such as COUNT(DISTINCT id). CREATE INDEX idx_d ON `travel-sample` (geo.lat, geo.lon, DISTINCT public_likes, id) WHERE type = "hotel"
In this case, the predicates are on the leading keys up to and including the array key. Therefore, indexer can efficiently do the grouping as seen by the optimal plan below. It’s important to note the array index key is created with a DISTINCT modifier (not the ALL modifier) to get this optimization and that the SATISFIES clause in the ANY predicate must be that of equality (that is, v = “%a%”). CREATE INDEX idx_e ON `travel-sample` (ALL public_likes, geo.lat, geo.lon, id) WHERE type = "hotel"
In this case, the UNNEST operation can use the index because the leading ALL array key is the array being unwound. Note, the unwound operation repeats the parent document (travel-sample) and the t.geo.lat reference would have duplicates compared to the original travel-sample documents. Not every GROUP BY and aggregate query can be handled by the indexer. Following are some simple rules that will help you to write the proper queries and design the required indexes to get the most of this feature. All the query predicates are able to convert into ranges and able to push to indexer. The whole query must be covered by an index. For a query to be covered by an index, every attribute referenced in the query should be in one index. Query should not have operations such as joins, subquery, or derived table queries. GROUP BY and aggregate expressions must be simple. Like any feature in a query language, there are subtle variations between each query and index that affects this optimization. We use the travel-sample dataset to illustrate both positive and negative use cases. The following table lists the scenarios and requirements for queries to request the indexer to do the grouping and acceleration. When the requirements are unmet, the query will fetch the relevant data and then do the grouping and acceleration as usual. No application changes are necessary. The query plan generated reflects this decision. One of the common cases is to have both predicates and GROUP BY on leading keys of the index. First create the index so that the query is covered by the index. You can then think about the order of the keys. The query requires a predicate on leading keys to consider an index. The simplest predicate is IS NOT MISSING. Example 1: List the cities with the landmarks with the highest latitude. Use the MAX() aggregate to find the highest landmark latitude in each state, group the results by country and state, and then sort in reverse order by the highest latitudes per state. In this query, we need to give the predicate country IS NOT MISSING (or any WHERE clause) to ensure this index is selected for the query. Without a matching predicate, the query will use the primary index. The indexer will return pre-aggregated results. Results can have duplicate or out-of-order groups. The N1QL indexer will do 2nd level of aggregation and compute the final result. The N1QL indexer can pushdown only if the leading key has a predicate. Example 2 (A): List the states with their total number of landmarks and the lowest latitude of any landmark. Use the COUNT() operator to find the total number of landmarks and use the MIN() operator to find the lowest landmark latitude in each state, group the results by state, and then sort in order by the lowest latitudes per state. The "partial": true line means it was pre-aggregated. Example 2 (B): List the number of landmarks by latitude and the state it’s in. Use COUNT(country) for the total number of landmarks at each latitude. At a particular latitude, the state will be the same; but an aggregate function on it is needed, so MIN() or MAX() is used to return the original value. Example 3: Like Example 1 with the GROUP BY fields swapped, list the landmarks with the lowest longitude. Use the MIN() operator to find the lowest landmark longitude in each city, group the results by activity and city, and then sort in reverse order by the lowest longitudes per activity. When grouping on an expression or operation, the indexer will return pre-aggregated results whenever the GROUP BY and leading index keys are not an exact match. For comparison, the below index and query combination will yield pre-aggregated results. Pre-aggregated Syntax: The GROUP BY and Index keys don’t match. Example 4 (A): A field with an expression. Let’s say the distance of a flight feels like "nothing" when it’s direct, but feels like the true distance when there is one layover. Then we can list and group by flight distances by calculating the distance multiplied by the stops it makes. Example 4 (B): An operation on a field. Let’s say the distance of a flight feels like "nothing" when it’s direct, but feels like the true distance when there is one layover. Then we can list and group by the uppercase of the airport codes and listing the flight distances by calculating the distance multiplied by the stops it makes along with the total distance. NULLS and MISSING are two separate groups. If there is no filter, then pushdown is supported for an expression on the Document ID META().id in the GROUP BY clause. If there is a filter on the Document ID, then the primary index can be used as a secondary scan. Example 6: List the number of countries that are in each decile of the META().id field. Example 7: LIMIT with GROUP BY on the leading key. The limit is pushed to the indexer because the GROUP BY key matched with the leading index key. To use Aggregate Pushdown when there is an OFFSET clause and a GROUP BY clause on one or more leading keys, use the following example of the index and query statement. Example 8: OFFSET with GROUP BY on a leading key. The offset is pushed to the indexer because the GROUP BY key matched with the leading index key. Example 9 (Q1): Multiple Aggregate without GROUP BY key. Example 9 (Q2): Aggregate without GROUP BY key. Example 9 (Q3): Multiple Aggregate without GROUP BY key. Example 9 (Q4): Multiple Aggregate without GROUP BY key. Example 10: List the landmarks with the highest latitude. Use the MAX() operator to find the highest landmark latitude in each state, group the results by country and state, and then sort in reverse order by the highest latitudes. Currently, the only aggregate functions that are supported are SUM(), COUNT(), MIN(), MAX(), and AVG() with or without the DISTINCT modifier. If the DISTINCT aggregate is on the leading GROUP BY key(s). If the DISTINCT aggregate is on the leading GROUP By key(s) + 1 (the immediate next key). If the DISTINCT aggregate is on a constant expression (GROUP BY can be on any key). If there is no GROUP BY and the DISTINCT aggregate is on the first key only or in a constant expression. Case #1: If the DISTINCT aggregate is on the leading GROUP BY key(s). Example 12-1 (A): A DISTINCT aggregate on the leading GROUP BY key(s). Example 12-1 (B): A DISTINCT aggregate on the leading GROUP BY key(s). Example 12-2 (A): A DISTINCT aggregate on the leading GROUP BY key(s) + 1 (the next key). The results will be pre-aggregated if the GROUP BY key is non-leading, as in this case and example. All other cases of DISTINCT pushdown will return an error. Example 12-4: A DISTINCT aggregate on the first key only or in a constant expression, and there is no GROUP BY clause. Example 13: HAVING with an aggregate function inside. List the cities that have more than 180 landmarks. To use Aggregate Pushdown when a LETTING clause has an aggregate function inside, use the following syntax of the index and query statement. Example 14: LETTING with an aggregate function inside. List cities that have more than half of all landmarks. HAVING or LETTING clauses, unless there is an aggregate function inside. ARRAY_AGG() or any facility to add new Aggregate function, such as Median. LIMIT pushdown with GROUP BY on non-leading keys. OFFSET pushdown with GROUP BY on non-leading keys. A subquery in a GROUP BY or Aggregate pushdown. plan.`~children`[0.covers] shows that the index covers the query. plan.`~children`[0.index_group_aggs] shows the aggregation and groupings done by the indexer. index_group_aggs object has details on the aggregate, index key position, expression dependency, and group expressions handled by the indexer. This object is present in the plan only when the indexer handles the grouping and aggregation. Array of Aggregate objects, and each object represents one aggregate function. The absence of this item means there is no Aggregate function. List of index key positions the GROUP BY expression depends on, starting with 0. Group expression or an aggregate expression. Key Position to use the Index expr or the query expr. A value > -1 means the group key exactly matches the corresponding index keys, where 0 is the 1st index key. A value of -1 means the group key does not match the index key and uses the query expression instead. Array of GROUP BY objects, and each object represents one group key. The absence of this item means there is no GROUP BY clause. "text": "select name, count(1)\nfrom `travel-sample` use index (idx_name)\nwhere name is not missing\ngroup by name;"
When the index_group_aggs section is present, it means that the query is using Index Aggregations. Index key position of a single GROUP BY expression, starting with 0. Unique ID given internally and will be used in index_projection. The Query Plan sections of an Aggregate pushdown are slightly different than those used in a GROUP BY.